If there’s one thing a good travel blogger likes, it’s a list. We could munch through twenty or more lists in a day. To-do lists. Must-do lists. Been-there-done-that lists. Slept with a Frenchman lists. Twitter lists. Packing lists. The list goes on. But if there’s one list the modern day travel blog author needs, it’s this list. 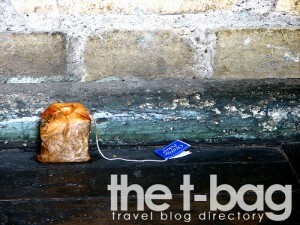 I created The T-Bag: Travel Blog Directory for two reasons. Firstly, I kept getting emails begging me to put a link to so-and-so’s travel blog, and they’d do the same. After a while, the angel got tired of speaking in an echoic voice, so she sat down with me at my laptop, and together we punched out the travel blog directory that would become known as the T-Bag. It’s all explained on the page, just remember that you need to scroll down to the bottom to fill out the form. I’m going away for the Easter weekend to walk around the central North Island of New Zealand. I’ll be exploring the Tongariro National Park and scrambling around Lord of the Rings country in an overly excited manner (think Sound of Music meets Fantasia). It’s the fast-growing list of travel blogs, and I’ll be updating it upon my return on Tuesday; help me appease the Angel’s in my life, by adding your travel blog. How does that sound? I added TravelofAnts to my list too. .-= Vi´s last blog ..No departure tax in Kathmandu (KTM) airport =-. Please add http://www.jrosworld.com/ as well. Be really appreciated!